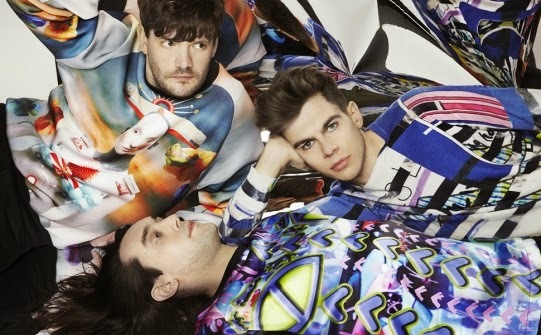 Discopop Directory: Can someone sound the Klaxons' klaxon? Like the Nintendo Wii and Kevin Federline, The Klaxons were big news in 2006, after which they apparently hitched a one-way ride to dumperville. Their own new material started to appear in March, led by the dreamy, Gorgon City-produced There Is No Other Time. It "peaked" at number 42 in the charts, which is worse than it deserved. Maybe a guest verse from Pitbull or Jason Derulo would have helped. Undeterred, the band are back for another crack at the top 40, this time with Show Me A Miracle, which singer Jamie Reynolds calls a naive response" to dance music. "We were listening to a lot of Bauer and a lot of R&B and hip-hop," he told Zane Lowe, "genres we've never tried to make before. We just got together around a table and started trying to replicate it." Have they succeeded? Not really. This still sounds exactly like a Klaxons record. But a very good Klaxons record, nonetheless. The Klaxons' third album Love Frequency will be released on 2 June, with production from Tom Rowlands of the Chemical Brothers, Erol Alkan, LCD Soundsystem's James Murphy and more. So there you go.